This page was created to share WHC news and events with an eye towards supporting our local small businesses and farmers. To that end, we are sorry to pass on that Casual Gourmet is closing. 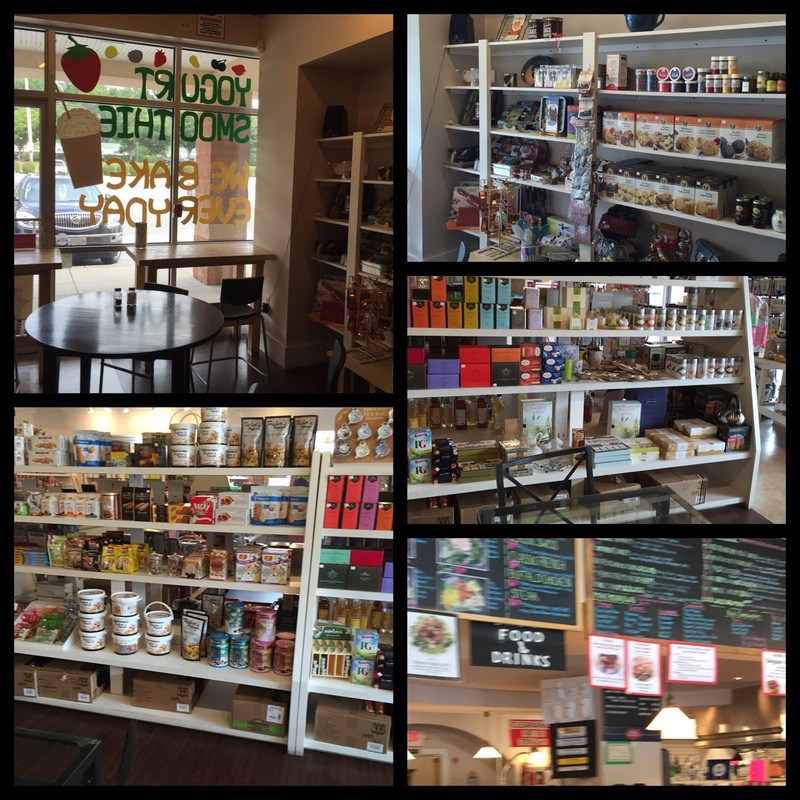 The owner is a WHC resident and Cattail neighbor-we wish her the best and thank her for being a source of last minutes gifts and local non-chain cafe options. In the meantime, merchandise is 30% off. Now, Glenwood is not really my neck of the woods but I have indeed visited the Casual Gourmet several times, both on my own and with my family. It was a lovely little place to have a tasty lunch or cup of coffee, and a fun gift shop for “noodling around”in. Perhaps there was too much noodling and not enough actual shopping to keep the place afloat. I do know that the businesses in those shopping centers are hampered by inadequate septic capability. The Casual Gournemt was unable to provide bathrooms for customers, for instance. Across the road Books With a Past and the Damon Foreman Music Academy seem to be doing well, but overall there continue to be vacancies. Not enough “foot traffic”? Rent too high? I don’t know. The Casual Gourmet always reminded me of similar establishments in Roland Park in Baltimore. That made me wonder if folks in Glenwood were much like “Roland Park Types”. This is a completely untested theory, I hasten to add. Some characteristics of Roland Park Types include the wherewithal to send one’s children to private schools, and the need to purchase just the right hostess gift for each occasion. 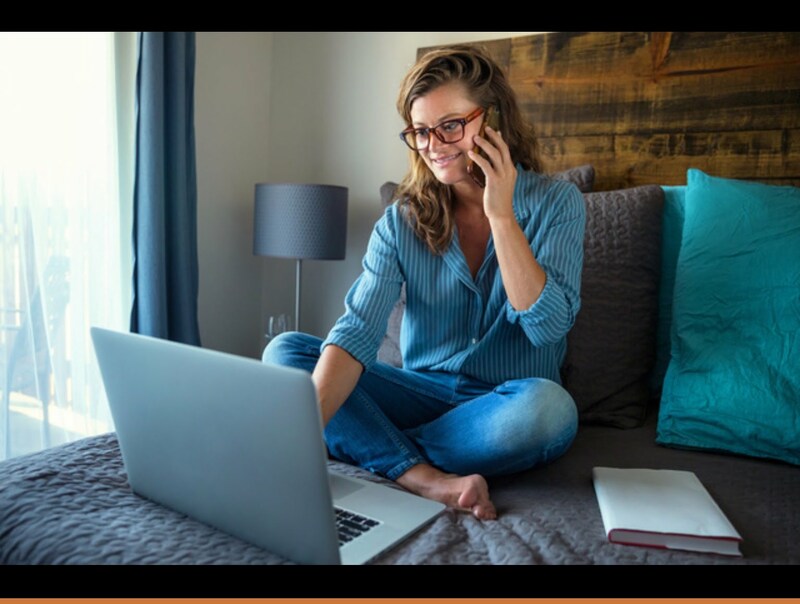 Running an independent, Mom-and-Pop small business is difficult in a world of chain stores and ever increasing rents. I wonder what the developer of those two shopping centers had in mind when the land as set aside for that use. Who owns them now? Are there any plans to make the vacant spaces more successful? But for now, a fond farewell to a lovely little place way out West. I know it will be missed. Santa, that is. I’ve only had two entries to my caption contest. Perhaps I should actually announce a prize on the off-chance that winning something might be a motivator. Winner of the caption contest will receive a 25 dollar gift certificate to the Second Chance Saloon in Oakland Mills. There’s plenty to unpack in this photo. 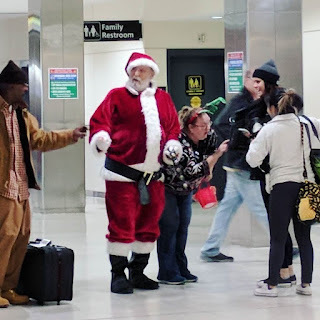 There’s the gentleman at the far left, then Santa, of course, and the group far right. Not to mention the setting and the signage. Get creative! Could we be seeing a crime scene unfolding? A flashmob gone wrong? To get your imagination going, here are the two entries I’ve received so far. Someone told me it’s all happening at the park. 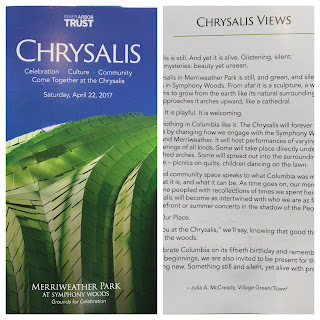 I received a letter from Nina Basu of the Inner Arbor Trust reminding me of everything that’s happened at Merriweather Park in Symphony Woods this year. It’s an impressive list for Year One. 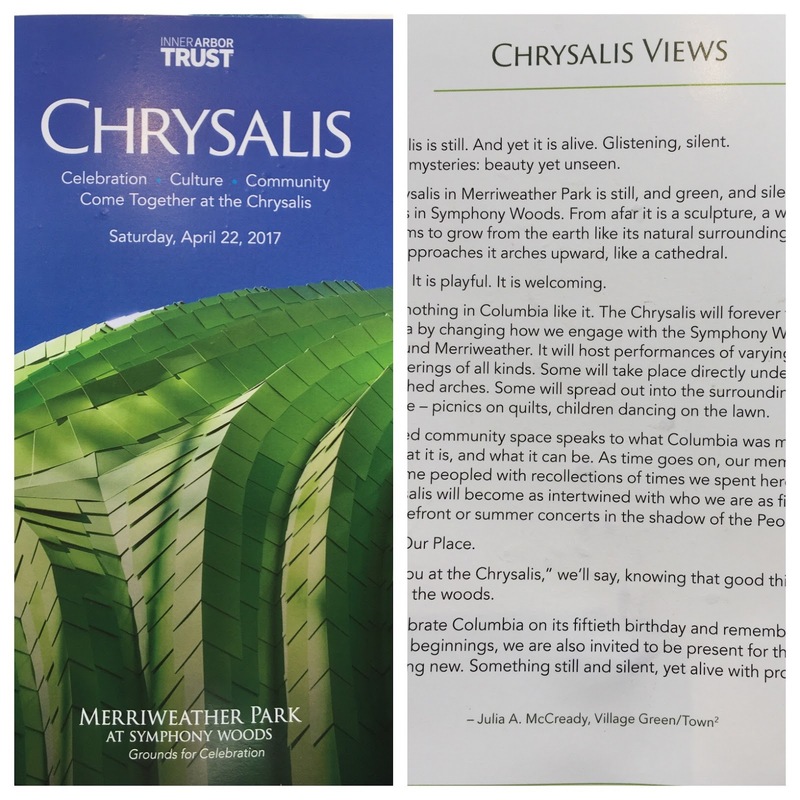 Brought over 500 people together in the pouring rain to celebrate the opening of the Chrysalis! This is the time of year when many non-profits are clamoring for your year-end donation. It is easy to become overwhelmed with the number of appeals that arrive in the mail or fill one’s inbox. There are charitable institutions that provide food or healthcare. There are political causes that promote and defend a healthy democracy. And there are those nonprofits like the Inner Arbor Trust that support the arts, community involvement, and quality of life experiences. We all make our own choices of how to divvy up the limited funds we have to disburse. A million impassioned emails can’t decide what is right for you. But if you are able to devote some of your money to the Inner Arbor Trust this year, you’ll be investing in a positive and vibrant future for our community. Even if your donation is small, it’s a vote of confidence for a park that’s for everyone. It’s a bitter cold day and we’re in the darkest season of the year. This is when gardeners pore over seed catalogues, planning their upcoming season. So plant some hope for the Spring. Help make something grow. 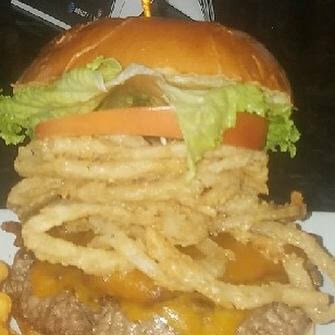 A place called Players Bar and Grill in Woodstock has a released a photo of their new HoCo Burger which will be featured on their 2018 menu. It looks scary. If your New Year plans include trying to eat in a more healthy way, you might want to skip this. Internationally known HoCo photographer David Hobby (aka Strobist) posted a photograph of long lines of local citizens waiting to prepay property taxes. HoCo Director of Finance Stanley J. Milesky now reciting The Night Before Christmas *from memory* to people waiting to prepay 2018 property taxes. He had no patience with representatives from national news outlets who were hoping to get rights to use said photo for free. 3. OK, Ilana, since you don't have a rate, how about $250? 3/ ABC is a subsidiary of The Walt Disney Company, which as of today has a market capitalization of $162,570,000,000.00. 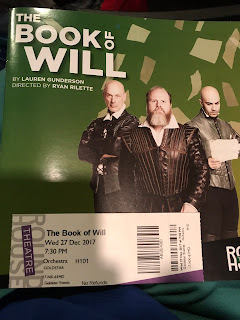 My daughter and I went to see this show last night in Bethesda at Round House. There’s only a few performances left in this run. It’s brilliant. Go see it! We got a Groupon for our seats. From a story by ABC2 News, “Howard County named one of the richest counties in America”. I’m guessing this is a stock photo, but what on earth is it supposed to represent? Your guess is as good as mine. Finally, the pièce de resistance. This photo from Howard County artisan Kristen Carrasco, taken at the airport. Really? There is so much going on in this photograph that I think we should have a caption contest! Submit your entries here and in the meantime I’ll think of a prize. So reads the comment on a Facebook post from the Howard County Police Department about a Christmas Day stabbing at the Trellis Center on Hickory Ridge Road. Let’s play along. Imagine it’s 1967 and Columbia doesn’t get founded. In the perennial holiday favorite, “It’s a Wonderful Life”, Jimmy Stewart’s character George Bailey is in the throes of a personal and community crisis when he wonders whether his life is worth living. An angel-in-training, Clarence, is sent to show him what life would be like if he had never existed. What would Howard County be like without Columbia? One clue is how excruciatingly long it took for the school system to implement school integration: eleven years after the 1954 Supreme Court ruling. That tells us that negative attitudes about whites and people of color learning together were deeply entrenched. Not to mention the founding of Glenelg Country School in 1958, a seeming “solution” to the “problem” of integration. More racist? Maybe. Less diverse? Almost certainly. It’s uncertain whether many of the institutions we now rely on and enjoy would even exist in their present form today: Howard County Hospital, Howard County Community College, Howard County Library System, for example. These all contribute to our quality of life, whether we live in Columbia or HoCo. It’s difficult to predict how long it would have taken for Howard County to be able to establish such thriving community pillars without the social and economic driver that was Columbia. On the other hand, Howard County might be more rural. Bucolic? Pastoral? Perhaps that’s what Mr. Man from Daytona Beach, Florida is driving at. Would we look more like Old Ellicott City? Western Howard County? Elkridge? That’s quite a few question marks. What would Howard County be like without Columbia? Would it be better? Would no one ever get stabbed? Would the world be better if Columbia had never existed? There’s evidently people out there who believe that. They’re entitled to their opinion. I’m certainly not one of them, however. Clarence: [to George] Strange, isn't it? Each man's life touches so many other lives. When he isn't around he leaves an awful hole, doesn't he? Happy Holidays everyone! Next week, for our 20th show, we’re doing a special “year in review” episode. If you have some ideas about what Tom and Candace should discuss, please post them below. You can find the request on their Facebook page. In yesterday’s post I put forward the claim that change in the Howard County Schools was one of the top local stories of 2017. I can think of a few others, but I’m more interested in what you think. Columbia-centric stories? HoCo stories? Politics? Business? Education? Arts? Neighborhoods? 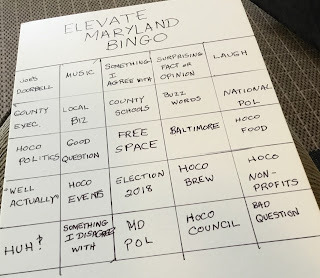 Of course, Elevate Maryland is interested in state-wide stories, so if you’re up-to-date with important Maryland events, throw one of those out there for consideration as well. Then, with a sense of satisfaction and accomplishment, you can go forth and have a great day doing what you love. Perhaps you’ve seen it. A little twist on the traditional Christmas narrative. 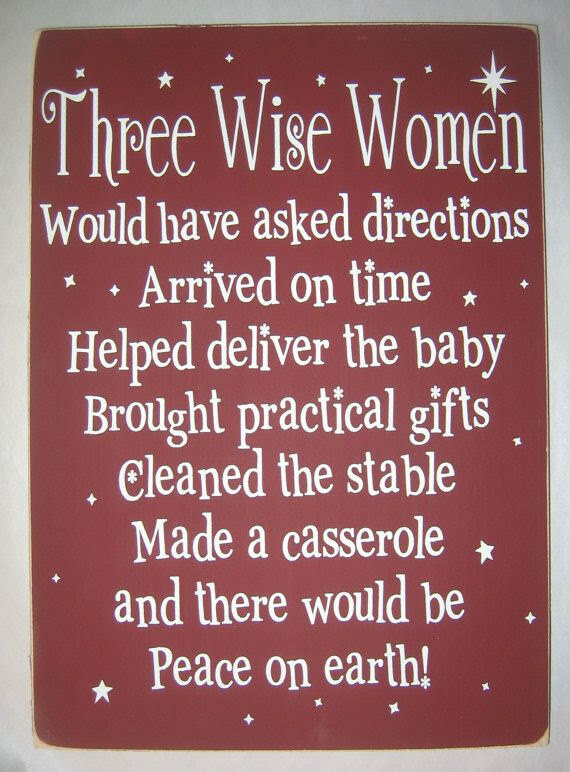 This Christmas, and as the year comes to a close, I am thinking a lot about three particular Wise Women whose journeys toward the truth brought light for the rest of us in Howard County. The change in the leadership in the Howard County School System is one of the biggest news stories of the past year. Of course it began with the election of new Board of Education members the November before but it continued to be big news through 2017. Many local citizens worked to bring positive change to our schools. I’d like to highlight three without whose efforts we probably would not be where we are today. Vicky Cutroneo, founder of the Mold in Howard County Schools Facebook page, also HCPSS Shares. Former BOE candidate, present President of PTACHC. Her persistent advocacy for students, parents, teachers, and staff in mold-affected schools was instrumental in shaping the conversation about transparency and responsiveness in our schools. She created an informal clearing house of information about where mold had been spotted, what kind of symptoms it had caused, and what action, if any, the school system had taken. Her determination to get the truth out in the face of continued obfuscation and obstruction extended to giving testimony in front of the Board of Public Works and supporting improved legislation in Annapolis. She stepped out of her comfort zone to run for the Board of Education. 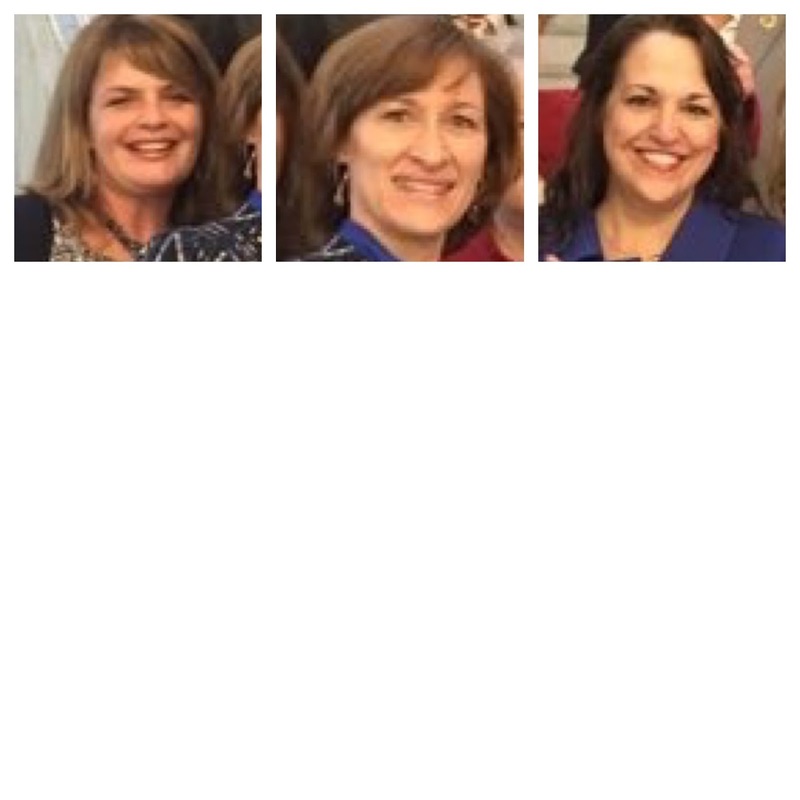 Although she did not win, she continued her nonstop advocacy and was elected President of the PTA Council of Howard County, where she is bringing much needed energy to programming that supports the goals of member school PTAs and parents. Barb Krupiarz, former President of SECAC, affectionately known in some circles as “the $10,000 woman.” She fought to get the School System to release the results of a $300,000 sole-source special education audit which the (now “retired”) Superintendent claimed did not exist. For this she was rebuked with an almost $10,000 fine. Many people would have been defeated by this experience. Not Ms. Krupiarz. She channeled her disappointment into working for the election of more responsive board of education members. She created a website, “A Better Board of Ed.”, created advocacy videos focusing on important issues, and gave testimony in Annapolis in support of improved legislation. In fact, she actually helped to shape that legislation,. When her $10,000 was returned by new Superintendent Michael Martirano, she used that money to help establish the Grace McComas Memorial Scholarship. Christine McComas, mother of the late Grace McComas, a Howard County student who died by suicide after sexual assault and subsequent online bullying. Ms. McComas’s unconscionable treatment by the School System after the death of her daughter is truly mind-boggling. They withheld school records, refused to allow a memorial page in the yearbook, and tried to refuse any memorial action for Grace at what would have been her high school graduation. In the face of all this Ms. McComas persisted. She worked to create Grace’s Law in Maryland. Grace’s Law was makes it a misdemeanor to repeatedly and maliciously use a computer or smartphone to bully someone under the age of 18. She visits schools to talk about cyber-bullying, and continues to raise funds for the Grace McComas Memorial Scholarship, which will be awarded to students who exemplify and encourage kindness. So there you have it. 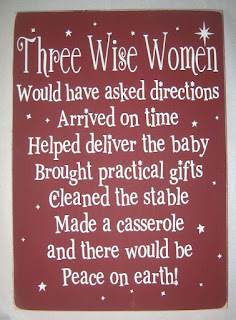 Three Wise Women who kept “following the star”, as it were, even though the journey was both long and difficult. I truly believe that our school system is in a better place today because of their commitment and hard work. Today, as I contemplate Christmas miracles, I am grateful for them. Lucy Van Pelt: [Someone who can really write about commercial] Real estate. I read this news yesterday and couldn’t help but think about the late hocoblogger Dennis Lane. Our friend @builtbycostello is at it again w purchase of #ColumbiaMD @Sheraton. Cant wait to see what's in store. Dennis would’ve been all over this. In fact, he would have known about it long before the parties involved had signed on the dotted line. And he also would have had a subscription to the Baltimore Business Journal, which I, sadly, do not. (Note to self: get on that!) Here he writes about a previous upgrade in 2009. I did a quick search on Costello on his blog and found this. That’s the thing. I shouldn’t need to be looking backwards to find the straight dope on hocolocal commercial real estate. I hope that 2018 brings us someone who knows their stuff and has a sincere enthusiasm to inform the community about what it all means. If there’s already someone emerging- - let me know. Or, if it could be you, get moving! Time’s a-wasting! This Christmas my husband and I decided that, instead of giving each other traditional presents, we would choose two things to do for the house and get them repaired. This is a first for us. He chose the upstairs hall light, I chose the kitchen faucet. Woo hoo, you’re thinking. What could be more romantic. Yes, I know. O. Henry it ain’t. But for us they are pretty thrilling. Both have probably been broken for over a year and we have just been accommodating to deal with it. No upstairs light? Turn on your phone to light your way in the dark. 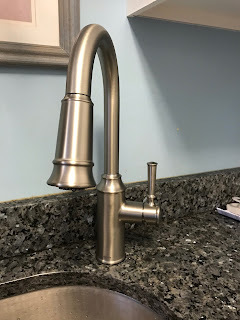 No sprayer on the faucet? Run the water really slowly and step back in case of possible attack. Or get a towel. Or two. I chose professionals that I had seen recommended on the Clarksville Happenings Facebook page. Eric Fries (Eric’s Electric) and Ehrhardt Plumbing. In both cases they fit me in right away, and did excellent work. I’d definitely hire both again. And it’s rather embarrassing how excited I am about having a functioning kitchen faucet. I clearly remember when my parents got to this stage of life. I was a teenager at the time. I could not comprehend that they made the choice to forgo having actual presents to unwrap on Christmas morning. This was proof to me that being a “grown-up” seemed to involve some kind of sellout of one’s inner sparkle. Remember, these are the same people who go to work when they’re sick, drink a bitter-tasting morning beverage, and eat their vegetables. I was sure that that was not going to be me. No sir. It’s particularly sweet for me because I have a job that allows me the week before Christmas off, and the necessary funds to make the repairs. And a stable marriage that allows me to use those funds in that way rather than on mere essentials. Every single part of it is a gift. The fact that the amount of money I spent on repairs is far more than what I would have spent on my entire Christmas (including food) when I was a single parent is not lost on me. Holiday joy takes many forms. It may be in the opening of that special gift, or in a family gathering, a concert, or in a faucet. If you haven’t already seen it, here’s what the kids would call an “epic” unwrapping video, which takes place at Long Reach High School. My husband, a High School teacher, has watched it about ten times already. Why? Because he sees so clearly the joy in both the giver and the recipient. You don’t need a big red bow on a brand new Lexus to know the spirit of Christmas. Whatever holidays you celebrate, I hope you find just the right sweetness to salve your soul this season. How can I be expected to plan for my future when the literal apocalypse is going on? He’s got a point there, even if the use of the word ‘literal’ is not assured in this case. And I really hope it isn’t, I hasten to add. Any young person who is paying attention to national and world events must be feeling the onslaught of challenge that their generation is facing. While there’s nothing new about older folks making decisions that fall most heavily upon the young, right now the speed and gravity of those decisions are breathtaking. I noticed that members of the Stop the Bleed initiative recently came to River Hill High School to teach “life-saving battlefield-injury techniques” to the ninth grade class. I’ve also noticed that the Howard County Police Department held a presentation on Safety and Security for Houses of Worship that was so well-attended that they have scheduled another one in January. Why might students need battlefield injury techniques at school? Why are Howard Countians worried about safety and security in their places of worship? I suggest you Google “school shootings” and “church shootings”. It speaks volumes about the world in which our young people are coming of age today that these are the actions we are taking. We are standing on our heads rather than adressing the real issue. We are not immune from that in our own little Bubble of Columbia/Howard County. A recent New York Times article addresses the fears of Columbians that the newly-passed tax bill will undermine the very essence of what Columbia was meant to be. As the gap between the haves and have-nots widens, and the stress of entrenched poverty and racism takes its toll, we see young people struggling and lashing out at school. They don’t need more discipline. They need more possibility. More opportunity. It’s not enough just to make the babies. We need to work daily to be able to pass along a world that can go on. Hopelessness is a heavy weight to carry. We should not be foisting it upon our young. I try to limit the occasions when I reach into my ‘back catalogue’, but this popped up today and it still makes me smile. I hope you will enjoy it as well. Exhorbitant photo fees. Requirements to buy large photo packages. Prohibition of parent-taken photographs. It was now Santa only for the well-to-do. It went against everything they all believed in. Mr. Edelson raises some excellent points here. Recent discussions in Howard County about possible high school redistricting have exposed some ugly generalizations if not downright racist attitudes about “those students”from “those neighborhoods”. It’s extremely concerning that this article appears to feed that line of thinking rather than do the research necessary to place recent incidents in context. Open up today's Flier. There is an article titled, "County teachers training in conflict resolution." That sounds like a good program. The article itself, however, leaves me feeling that we're seeing more of the same reporting about a couple of schools. Despite several hundred arrests at Howard County schools over the last few years, only two schools are named in this article, Oakland Mills High and Wilde Lake High. I have to assume (because the article provides few facts about other schools) that things must be happening at other schools. Yes, two very recent events happened at OMHS and WLHS, but are these schools anomalies? Do we really know the gender of each student arrested, the level of school at which they were arrested, but not the school itself? If this is a county wide effort, why are only two schools named in the article? If the analysts who work for me in my professional life were evaluating a program and turned this in to me, I would send it back. I would ask them if they even attempted to pull data on other schools or contact them. I would ask them what makes 2 schools out of 76 unique. Wilde Lake's Principal should be commended for taking action to address an issue at his school. Instead, his letter to families is also used as easy headline fodder for reporters. I see similar laziness in reporting about Oakland Mills. The police released this information about the fight at OM just as they release information on dozens of other calls they receive each day. It didn't take much investigative journalism to highlight these two schools as exemplars of what may be a county-wide issue. So once again, I'll ask, is it just me, or do we need to push our local media to work a bit harder in their reporting on our schools and communities? I raised this in my remarks at this week's village board meeting, and the resounding response from my colleagues on the board was that we need to start pushing for better, balanced coverage now. Mr. Edelson’s work appears here with his permission. What kind of news do you need to know daily? Weather? Traffic? In the Summer, do you check air quality reports? Road construction? I’ve noticed a new daily report in Howard County. This one was tacked on to the end of the police blotter, but ordinarily, they are publishing these as stand-alone posts on Facebook. Since the Friday, Dec. 15 daily crime bulletin, police responded to four non-fatal overdoses. In three of the overdoses, Narcan was administered and the person was transported to the hospital. *In fatal cases, some deaths are pending autopsy results for opioids and/or other substances. Numbers may fluctuate. Of the 166 non-fatal opioid overdoses, life-saving Narcan was administered in 148 incidents. If we don’t know anyone who is struggling with addiction, we may find it easy to scroll through those reports from hcpdnews. Perhaps that’s why the police department is making such a concerted effort to keep on posting them. This is a serious problem. In one way or another, it effects all of us as a community, and we ignore it at our peril. Now, there are some very real arguments to be made as to why the importance of addiction as a public health issue didn’t get serious attention until it extended to white people in large numbers. That’s absolutely a conversation that needs to happen. When addiction could be portrayed as a ‘minority’ problem, then it was painted as a criminal activity to be addressed with Law and Order tactics. Now that it could be a family member, friend, or co-worker of those in the dominant white culture, we are seeing a reframing of the issue with talk of public health and compassion. Long overdue, in my opinion. We should all be horrified that Howard County is consistently experiencing enough overdoses to warrant an almost-daily report. This is not something we should get used to as a ‘new normal’. Looking for support, information, or advice? Here’s a good place to start: Addiction Support in Howard County. I’ve just finished listening to this week’s Elevate Maryland podcast. Co-hosts Tom Coale and Candace Dodson Reed have been working their way through the ample field of Democratic hopefuls for Governor in the next election. This episode features the County Executive of Baltimore County, Kevin Kamenetz. There are so many good podcasts out there these days. I have found that I really need to focus when listening to Elevate Maryland because it’s too easy for me to get mentally distracted and let my mind wander. This is not something you can just let wash over you, like an amiable human interest story on NPR. You need to pay attention to get all the good bits. So, good teacher that I am, I created a listening hack for myself. Okay, it’s an auditory car bingo. But it works. I need a visual to keep my brain on track so it doesn’t hare off into the land of multiple to-do lists. Call it an educational support, if you will. About Mr. Kamenetz. While I found his stands on most of the issues to be reasonable, there was something else on display that I found troubling. There’s a vein of arrogance that runs through his interview that concerns me. Not to belittle any of Kamenetz’s actual accomplishments, but white men who ‘know everything’ are a dime a dozen in American politics and are, in many ways, why we are where we are today. Mr. Kamenetz is all about himself. There’s very little intellectual give-and-take in this interview. And there’s certainly no sense of sharing the spotlight with others. If you want to know where this interview went off the rails for me, it’s when he gets asked about the large field of candidates running. His response is breathtaking in its dismissiveness of other Democrats. Once he put that out there, it colored everything else he said. There’s clearly a sense that he thinks they should let ‘the big boys’ dominate the playing field and get out of his way. Should one interview on a podcast be all the research necessary to evaluate Kevin Kamenetz? Certainly not. But I suspect that this particular interview is far more informative than he realized. The holidays present unique challenges to those of us who crave gingerbread. We know we ought to be able to find it in plentiful supply, but, year after year, there seems to be less and less of it. 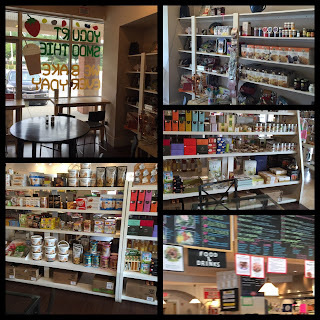 I stopped by Touché Touchet one afternoon recently. They had already sold out for the day. The clerk suggested that I call ahead next time. Call ahead? As though I know in advance when I am going to have a gingerbread craving? I need gingerbread men. Or gingerbread women, reindeer, stars—whatever. Why do we not have vendors on every corner at this time of year? Why do I find myself skulking from one possible supplier to the next when the Christmas season should be the gingerbread zenith of the year? And so I found myself, late on a Saturday afternoon, standing in line at Walgreens clutching a gingerbread house kit from the Clearance display. 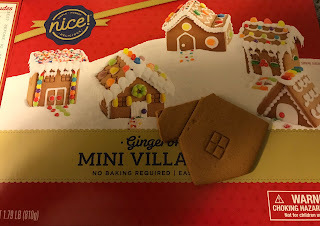 No, a gingerbread “village” kit. That baby never made it home alive. I ripped open the box in my car and went for the nearest piece. It wasn’t the good stuff but it would have to do. I now have a gingerbread village kit missing one wall and I feel rather ridiculous. Please help me, dear readers. Where can I buy decent gingerbread cookies in Howard County, Maryland? And not ones heaped in globs of icing, either. Just simple, spicy, classic gingerbread. I know I have a problem. And I’ll face it, I promise. Right after Christmas. Or maybe New Year’s. And now a few words about medical marijuana. Yeah, I never thought I’d write about it, either. In what may be the slowest roll-out ever, Maryland is finally getting their medical marijuana program up to speed. Kind of. The good news: they’ve increased the number of places that medical marijuana will be available. The bad news: they’ve got very little to sell, at least until March. My goodness. Could we have made this any more arduous? I became convinced of the case for medical marijuana by observing the lack of it. My mother suffered for quite a long time due to occluded blood vessels that led to her brain. For many people that would mean having a stroke. For her, it meant increasing dizziness, nausea, and fearfulness over loss of balance and equilibrium. Doctors were no help. They admitted that most people who had her condition never lived as long as she had. It just outright killed most people. So there was no viable treatment plan; it wasn't something that could be remedied by medication or surgery. Gradually, over a long period of time, she became unable to leave her bed. And constant dizziness and nausea made her reluctant to eat. I have become convinced that the use of medical marijuana would have given her a much improved quality of life as she grappled with a condition for which there was no cure. It would have helped alleviate her constant anxiety, and increased her appetite. That, in turn, would have stabilized her overall health. She endured years of increasing helplessness. It would have given her more of a sense of her own self at the end of her life, I think. Of course, I’m not a doctor, so this is merely speculation on my part. But it’s true that living through this difficult time with my family made me think seriously about what medical marijuana could do to help suffering patients for whom traditional treatments were inadequate. Does it seem to you that Maryland’s roll-out of medical marijuana is plagued by an underlying sense of ambivalence? Were the years of delays necessary to do this right? I’m curious about all this. This is one of those mornings where I can think of a variety of things to write about, but my brain is just not awake enough to perform the intellectual operations necessary to do them justice. The good news: tomorrow starts my Winter Break and I will have much more time to write. A little plug this morning for the Breezy Willow Farm Country Market. I stopped by on the way home from work to pick up some Neat Nick Preserves to give as gifts. I highly recommend this place. In addition to all kinds of locally grown/made foodstuffs, they are offering a variety of lovely holiday gifts. They’re on Frederick Road across from the Rita’s. You can park right next to the store. Service is friendly and helpful. I discovered last night that Home Slyce delivers, and I am now in serious trouble. They are the only place in Howard County that makes a decent baba ghanouj. I ordered online at six, the delivery was due at seven. It arrived at six thirty-nine. I had amazing baba ghanouj and a deliciously spicy chicken calzone and I have lots of leftovers. If you haven’t tried Home Slyce, you should. They are located on Snowden where Azul 17 used to be. Some months ago we were approached by Shake Shake burger joint to provide some seasonal pies for their new store location at the Columbia mall. Our pies would be mixed with their frozen custard (concrete). We are pleased to let you know that we are now official vendor for them and making our first delivery next week for their new store opening on December 20th. We are looking forward to work with them and hope you'll stop by to welcome them in our town. When you are there make sure you look for a frozen custard Pie Oh My made with our pie. I am looking forward to noodling around Main Street in Old EC with HoCoHouseHon next week. I can’t wait to visit Sweet Elizabeth Jane in their new location, and I’ve been hearing good things about a new restaurant called Georgia Grace Café. As we move into the winter season, there is one thing you can be sure of. If it snows in the evening, students will be on Twitter begging hcpss for a delay or a cancellation. This is the first generation who can use social media to petition for such a favor, and they haven’t been idle. They send photographs, video clips, anecdotes of slipping and falling, and generally do their best to wheedle and convince. I could be wrong but I don’t think that their wild protestation of weather woes have any impact on school closures. None whatsoever. But, as long as they aren’t outright rude or threatening, it’s pretty much a harmless pastime. I suppose all those tweets remain out there for future employers to search and evaluate, so maybe you don’t want to make a complete fool of yourself. This will be Interim Superintendent Michael Martirano’s first winter season at the helm. I wonder how he will take the sudden onslaught of interest in his twitter account every time the flakes start to fall. Will he take it with good grace? Will he show a sense of humor about the whole thing? From what I have observed so far, he’ll probably check to make sure his snowflake socks are ready to go, then he’ll tweet out an inspirational quote about how snow days are so much more joyful if you have put in the effort to complete your schoolwork the night before. Thanks to the efforts of some great community members, 400 hand-knit hats were donated to SFES (along with many other hats, gloves, and coats). All students were given a chance to choose a hat today, so don’t be surprised if your kiddo comes home with some stylish new winter gear. I love this. If everyone gets to choose a hat, no one sticks out as the “less fortunate”. The hats become not just protection against the cold, but community unifiers. “We’re all in this together.” What a remarkable statement of love made visible. Now, that’s some snow days news I can get excited about. This morning my Facebook feed is full of black women from Alabama with “I Voted”stickers and white people from all over the country celebrating. My Twitter feed is full of information that makes it clear that black women truly made the difference for Doug Jones in Alabama. And that this is not a new thing. @ShamekaErby: Don't just thank Black women. The time to be celebrating the talents, widom, and persistence of black women is long overdue. But it seems to me that we’re more comfortable celebrating their successes when they happen somewhere else. What about right here in Howard County? Since the presidential election a number of groups have sprung up locally to promote Progressive causes. Local activist Maureen Evans Arthurs caused some uncomfortable self-reflection for (almost exclusively white women) members by pointing out the stunning lack of diversity in these groups. Not to mention the fact that these groups were founded without an adequate understanding of African American advocacy groups that were already established and functioning. Elevate Maryland Co-host Candace Dodson Reed, herself the founder of the African American Community Roundtable—with support and guidance from Regina Clay— has expressed dismay at the casual dismissal and sometimes outright hostility by local members of her own political party. Good grief. If a member of the Democratic Central Committee can’t get respect “in her own country” then we are not getting the lesson we need to be getting. Celebrating the work of black women “over there” but not making room for it “over here” is just more of the same entrenched racism from self-described white allies that perpetuates white privilege. And it destroys any credibility we might have in the African American community. Call me crazy, but I don’t think that’s who we want to be.If we find ourselves saying, “oh, aren’t they inspiring!” nationally, followed by “why are they always harping on those same issues?” locally, then we have some uncomfortable self-reflection ahead of us. One year, I believe it was in 1966, my mother put her foot down and said no more messy Christmas trees. I was in the second grade and I was not happy about it. I loved the smell of pine in the house, the feeling of hanging ornaments on the prickly, bendy branches. But my mother was tired of being the one who had to water the tree and pick up the falling needles. Or she was tired of nagging her three children to keep up with that chore. I guess we forgot. A lot. It was our first year in Columbus, Ohio, in a newly-built house, in a newly-built subdivision. Everything in my world was changing. The fancy holiday dresses with scratchy petticoats that tied in the back with a big sash were pushed aside for slim, sleek mini-dresses. Popular culture was obsessed with the Beatles and the British Invasion. Aluminum trees were new and daring and my mother somehow got a bee in her bonnet that we were going to have one. At the time I felt that this put us at odds with Charlie Brown and Linus in the Christmas special that had debuted the previous season. I didn’t want a “shiny aluminum tree.” I wanted a real tree. But I was not so much a purist as to boycott the new tree altogether. I was there for its first unboxing. I listened to the magical “whoosh!” as each shiny branch came out of its paper tube. I helped to decorate it and admitted, grudgingly, that it looked good as the color wheel cast its ever-changing glow. But I clung to a loyalty to real trees in my heart. As an adult I have almost always had real trees. And I realized over time why my mother had gotten tired of the watering and the endless cleaning up of needles. But I’ve never warmed to the second generation, green, “lookalike” Christmas trees. I don’t know why. I just don’t care for them. Over the last few years I have begun to feel the stirrings of nostalgia for an aluminum tree. 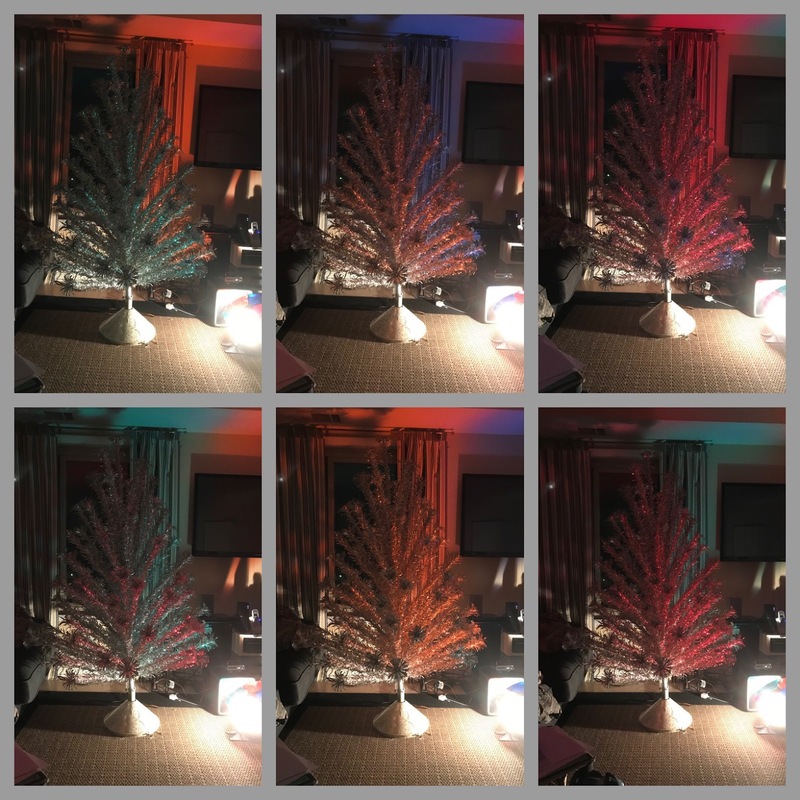 If I was going to put aside the joy of a real tree, if even for one year, I wanted it to be for something truly over-the-top, retro, quirky, bold. But my family was dubious. And the cost of vintage aluminum trees was staggering. Perhaps nostalgia gets us all in the end. My heart was full and my mind was filled with so many memories of that first Christmas in the new house in what felt like a whole new world. It wasn’t all happy. Much was uncertain. Just like today, I guess. Greetings from Twitter-Land this morning. As a part of my quest to promote school music programs on social media for HCPSM, I spend time daily reading all tweets mentioning “hcpss”. There’s probably a way to set up a system to do this. I pride myself on doing it “by hand”. It doesn’t take all that long, and I learn quite a bit about what’s happening in our schools. During the past four years or so, the message coming from Central Office and individual schools was full of educational buzz words. There were daily, if not hourly, references to World Class Education, College and Career Ready, data, rigor, grit, Gallup Strengths Finder, and testing, testing, testing. And let’s not forget Vision 2018. Controlling the message was a hallmark of the previous administration. It was clear the school administrators felt pressure to conform when composing tweets meant to inform their school communities. Day after day the educational gobbledegook flowed from every source. I often wondered if other parents found it as mind-boggling as I did. There has been a noticeable shift in what is being shared since the advent of Interim Superintendent Michael Martirano. This is only to be expected. His own Twitter account has focused on kindness, equity, and inclusion. He exhorts the community to be willing to do the hard work necessary to make those things happen. And, naturally, school accounts have reflected his priorities. But a greater change has been how individual schools are reporting on daily happenings. Admin are reporting on a greater variety of things that show learning, whether academic, social-emotional, arts experiences or physical development through sports. They appear to have much more freedom to simply inform the public of what they judge to be “share-worthy” experiences. Of course it’s all a part of a larger goal of public relations, but it looks much more like truth to me. As a teacher, I read the hcpss twitter feed with much more joy these days. As a parent, I’m being given a chance to see what is actually going on, instead of strings of eduspeak. I’m seeing a system that celebrates individual school communities, and values the ability of administrators to choose which stories to share. Yes, there’s an overall unity in priorities. We are a school “system”, after all. But I’m feeling a loosening of the grip when it comes to how The Message is shared. Truth in advertising: all of my observations here are made as an outside observer. No actual school system employees were consulted for the writing of this piece. So there is plenty that I do not know. I do know that it’s a whole lot more fun to do the hcpss Twitter scan these days. Our schools are doing some pretty cool stuff. Do you follow your child’s school on Twitter? You should. These days, you might actually learn something.